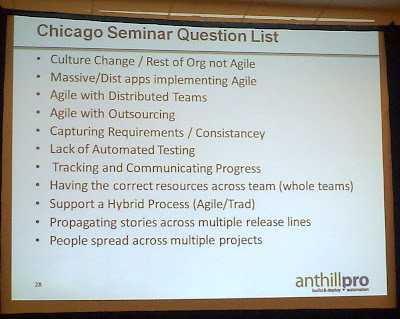 I'm at the Agile Comes to You seminar in Chicago, sponsored by AnthillPro, Rally Software and AccuRev. Our hosts asked each table of attendees to come up with a top "current challenge, obstacle or area of concern you have while planning or scaling your Agile adoption." Then the collected them, put them on a slide and had a panel discuss the concerns.